The British Army Literacy Test is an aptitude test that checks your reading and writing skills. 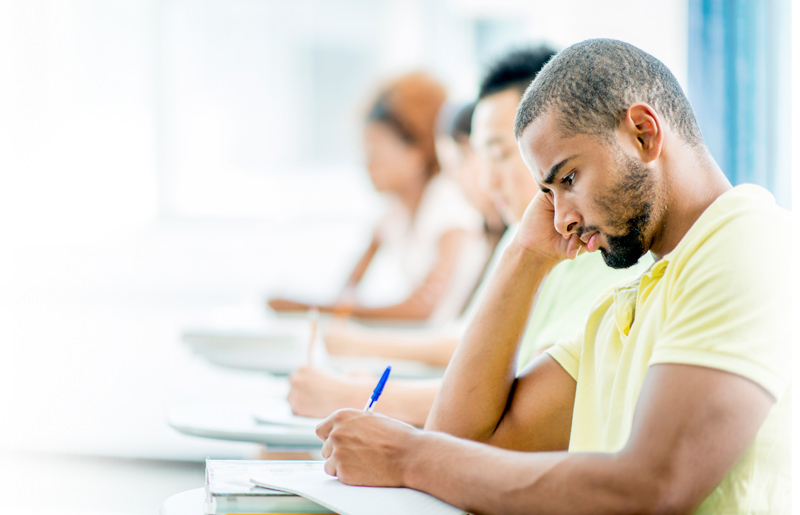 JobTestPrep now offers you free practice questions to prepare for your Literacy Test. What Is the Literacy Test? Being able to efficiently communicate with your team members is crucial in the army. To determine your language abilities, you will have to take the Literacy Test as part of the assessment at the Army Development and Selection Centre. The Literacy Test checks your English reading and writing skills. Do not worry if English is not your first language. If in this case your scores are low, you will be provided with further help in your initial training (Phase 1). Candidates with an English GCSE certificate of A*-C are not required to sit this test. Get the practise material you need to excel at your army literary test. Good luck! Read the four lines below. Which one has a mistake? (For example, a full stop, a question mark or a capital letter is missing or in the wrong place). He's sitting in a chair right now. John's dentist is unavailable this week. Why aren't you in school today? The doctors wives were invited too. a. Once when I was six years old I saw a magnificent picture in a book, called True Stories from Nature, about the primeval forest. b. Once when I was six years old I saw a magnificent picture in a book, called True Stories from Nature, about the primeval forest. c. Once when I was six years old I saw a magnificent picture in a book, called True Stories from Nature, about the primeval forest. d. Once when I was six years old I saw a magnificent picture in a book, called True Stories from Nature, about the primeval forest. Every autumn and winter, thousands of starlings pack close together and swirl across the sky in one of the natural calendar’s most dramatic spectacles. Although experts do not know for certain the reason behind the aerial displays, several theories for these murmurations have been aired. Probably the biggest theory is the idea of safety in numbers – it’s an anti-predator strategy. If you’ve got quite a big, swirling flock of birds, that creates a mesmerising sight. And that in itself – that movement, that motion – creates a situation where predators are actually confused and then can’t focus on any one individual bird to pick out and predate. a. Starlings usually swirl in murmurations after summertime. b. Starlings use a swirling motion to avoid anti-predator strategies, in order to successfully hunt their prey. c. Another well-established theory is that starlings use this formation to keep warm. We are currently working on a complete practice pack for the British Army Literacy Test. Subscribe below to let us know you are interested, and get a 15% discount when the pack is available.